The Pace Projector clearly shows that Bay of Plenty (#6) has a tactical advantage over his foes. He is the lone speed in the race, and he owns some of the fastest dirt speed figures in the field. That said, for whatever reason, his connections have focused on turf racing so far this year despite the fact that his prior dirt form was so encouraging. He hasn’t run in a dirt race in over 15 months, which is cause for some concern considering that he’s going to be a very short price. Most will look to Unbridled Juan (#1) as an alternative. While he’s earned this step up in class, he’s hardly the most reliable horse from a win perspective. 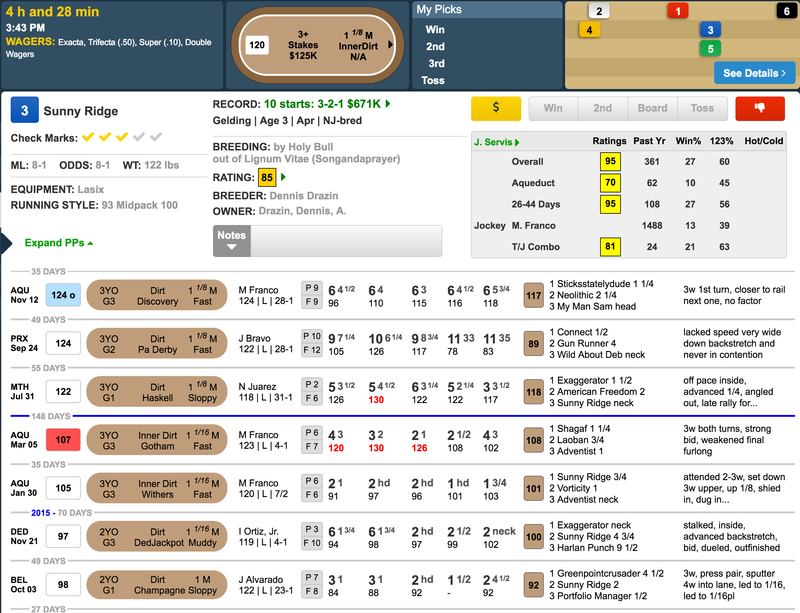 I instead want to give a shot to the three-year-old, SUNNY RIDGE (#3). This horse has run well enough against top-level competition on a few occasions. I know his Discovery looks disappointing at first glance, but that was a seriously deep field, and he did not get an ideal trip that day. The pace of that race was slow (color-coded in blue) and he just could never find clear sailing in the stretch. He possesses the tactical speed to be stalking Bay of Plenty early, and he can get the distance. Furthermore, rain in the forecast could lead to a sloppy track, which is his preferred surface. what is it–Sunny Ridge or Bay of Plenty?